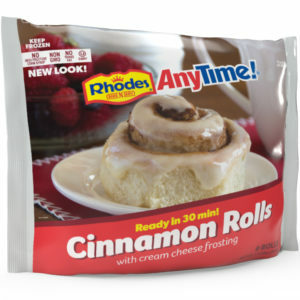 Rhodes Bake-N-Serv® AnyTime!® Cinnamon Rolls will bring pleasure to your taste buds and even more to your busy schedule. Simply take them out of the freezer, place them into the oven, and bake. Even better, our AnyTime!™ pan makes for a speedy cleanup. 6 rolls are packaged in a disposable baking pan package making your cleanup easy. 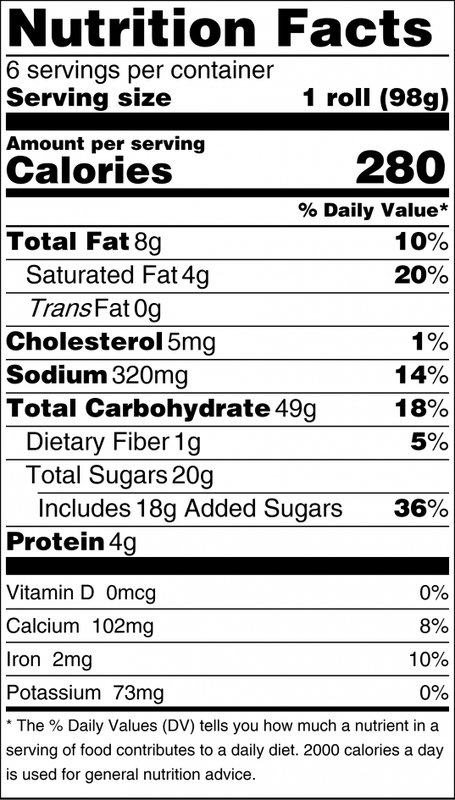 INGREDIENTS: Unbleached enriched white flour (wheat flour, malted barley flour, niacin, ferrous sulfate or reduced iron, thiamin mononitrate, riboflavin, folic acid), water, vegetable shortening, brown sugar, sugar, yeast, nonfat dry milk, soybean and/or canola oil, cinnamon, wheat starch, natural and artificial flavor, sodium bicarbonate, sodium aluminum phosphate, salt, rice flour, sunflower oil, sunflower lecithin, guar gum, dicalcium phosphate, polysorbate 60, monoglycerides, enzyme. FROSTING: powdered sugar, water, cream cheese (pasteurized milk and cream, cheese culture, salt, carob bean gum), vegetable shortening, butter, natural and artificial flavor. The first time we made these rolls, they were perfect. Then we bought them 2 more times. Both times they didn’t rise much and were tough. I tried frozen and then baking, and then thawed and baked. Still almost a freezer burn tough taste. Thank you for your comment! These are several things to look for when purchasing our products. Be sure to check the “best by” date on the front of the package, top left side. Make sure to use before that date and purchase them with plenty of time left, if you plan on using them at a later date. If not used before that date, the yeast will be inactive and the rolls will not perform as they should. Freshness is important with frozen food too! Also check the product for ice crystals and feel through the package to make sure the rolls are frozen individually and not stuck together. These are signs of mishandling probably prior to your purchase. Choose another package. Call our Customer Satisfaction Department at 1-800-876-7333. We would be happy to send you replacement coupons for those products that didn’t meet your expectations. I had the exact same experience as the previous commenter. The first couple of times I baked the Anytime CINNAMON rolls, they baked up big and fluffy, and the next two I tried they didn’t rise at all and we’re horrible. They weren’t expired, and weren’t stuck together. I went back to the 16 roll bags of frozen dough. They’re less convenient, but are consistently delicious. tHESE ROLLS ARE A FAVORITE OF ALL FIVE OF MY KIDS. i AM SO DISAPPOINTED IN THE NEW “VERSION”, THOUGH. tHE PACKAGING DOESN’T BOTHER ME, BUT THE ROLLS ARE SIGNIFICANTLY SMALLER! aND STILL THE SAME PRICE. vERY DISAPPOINTED. pLEASE GO BACK TO HOW THEY WERE.